Start Altering Climate to Stop Global Warming: Is it a Good Idea? Altering Climate to Stop Global Warming: Is it a Good Idea? Geoengineering or climate engineering is defined as a deliberate and large-scale intervention in the planet’s natural systems in order to counteract climate change and, more specifically, global warming. There are two types of intervention: those to regulate the solar radiation that reaches the Earth and those that aim to sequester atmospheric carbon dioxide (CO2), which is the main agent of the greenhouse effect. But each of these proposals could alter delicate some natural balances and thus their viability and their pros and cons should be analysed before making a decision. The idea is to inject large amounts of sulphate aerosols, which are particles less than one micrometre in diameter and remain suspended in the stratosphere, reflecting and dispersing part of the incident solar radiation. In this way we would replicate what happens in the large volcanic eruptions that expel massive amounts of these particles, which causes a significant drop in temperature in the months following the event. In favour of this alternative, there is information and data about both its mechanism of action and the resulting effects through the study of past volcanic events. It is also a reversible medium-term action, given that the permanence of these aerosols is approximately one year. The main drawback is that these particles can become sulphuric acid in the stratosphere, which attacks the ozone layer. A shield of space reflectors or mirrors blocking part of the solar radiation before it reaches the planet would be another possibility to stop the warming. It could be in a stable position, midway between the Sun and the Earth, or in orbit around the planet, such as the global positioning system (GPS) satellites. The great advantage of this futuristic proposal is that it would be reversible and immediately adjustable since the deployment and use of this shield would be controlled from Earth. The main inconvenience concerns the costs and the development of the technology that it requires. And it is also unknown how the biological cycles and circadian rhythms of living beings might be affected by the irruption of these luminous artificial satellites in the night sky. The albedo is the percentage of light radiation incident on a body or surface that is reflected. The proposed intervention would increase the reflective capacity of clouds and the Earth’s surface so that a greater part of the solar radiation is “returned” rather than absorbed. In clouds, this increase in the albedo is produced when there is an increase in the density of the water droplets in suspension making up the clouds. 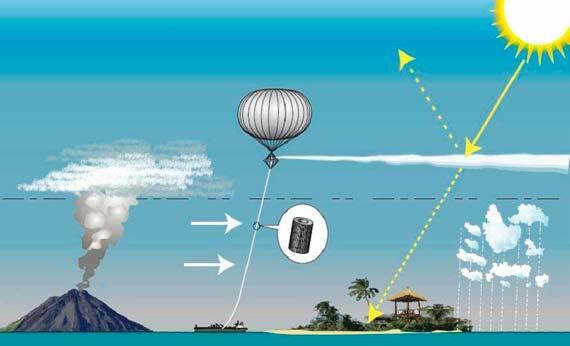 Thus, the task would be to try to reinforce this natural mechanism by using powerful jets of air to spray water from the oceanic surface so that the droplets thereby generated are incorporated at the base of the clouds. But it is not clear whether this action alone would be enough. On the other hand, it would be a short-term intervention with some positive aspects (minimal adverse effects, immediacy of results) as well as negative (cost, maintenance) given that the effect would only last a few days before cloud dynamics provoked rain. To increase terrestrial reflection desert areas could be covered with some reflective material, current crops replaced with others with a higher natural albedo (more leafy), and the roofs of buildings and roads painted with reflective paints. The major advantage, in addition to its relatively affordable cost, is that it would be reversible and also adjustable. The biggest drawback is that only a minimal percentage of the Earth’s land surface is desert, inhabited or crops. 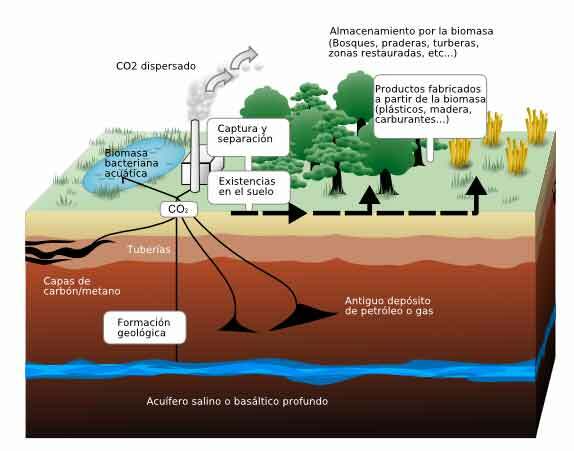 One of the proposals for the withdrawal and underground storage of carbon dioxide would involve the installation of huge towers or devices that filter the air and trap CO2 through the use of some kind of resins or adsorbent material. Once captured, the gas would be compressed at high pressures and later buried in geological deposits at great depth. The argument against this alternative is that this type of technology is very immature. In addition, the energy cost of the process would require the consumption of fossil fuels that would produce more CO2 than could be removed. And above all, there is the question of whether this is really a solution or, on the contrary, merely burying a time bomb that could explode at any time. The risk is that at some point in the future these deposits may collapse or leak due to seismic movements, cracks, overpressure, volcanic activity, etc. and release all that gas to the atmosphere at once, causing a sudden and brutal increase in the greenhouse effect. This technique does not refer to rain, but to the deposition of mineral particles from the atmosphere. This process occurs naturally when tiny particles of the silicates that make up the Earth’s crust are dragged by winds into the atmosphere where they react with CO2 to form carbonates that precipitate on the land or in the oceans. The great advantage of this method is that the mechanism, the reaction that governs them, is known and reproducible with a simple and affordable technology. On the other hand, it would require large-scale mining, which is one of the most polluting industries. In addition, it is unknown how this massive entry of carbonates would affect the composition and conditions of water and, therefore, marine ecosystems in the long term. 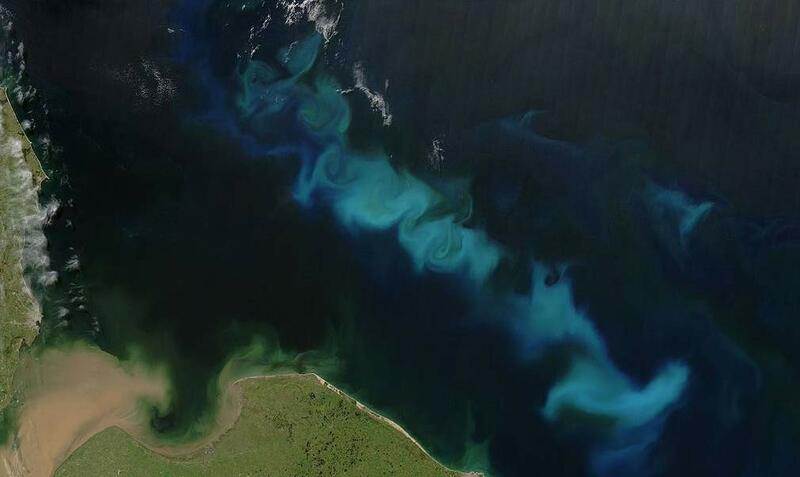 This idea involves the planting or introduction of nutrients in certain regions of the ocean to provoke an increase in the phytoplankton and with this a greater consumption (by photosynthesis) of the atmospheric CO2. It is therefore a matter of enhancing the natural cycle by which algae consume CO2 that passes into the food chain and is then released to sufficient depth by marine animals in their respiration. And this is its main drawback: should we act on an ecosystem as highly complex and at the same time as sensitive as the ocean without appropriate guarantees? In conclusion, climate engineering is no stranger to controversy. A widespread fear is that approving such interventions would cause efforts to reduce greenhouse gas emissions to cease. In addition, our understanding of the complex mechanisms, systems and cycles that regulate the planet’s climate is too limited to be able to predict the long-term consequences of an intervention of this magnitude. Whatever Happened to… Nuclear Fusion?